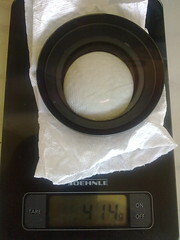 My mystery optics order from Surplus Shed of a very fast air spaced triplet and negative doublet arrived today. The weight is a bit of a concern, the triplet lens (D=155mm, f/1.23) weighs a whopping 2.5 kg and creating a stable focusable system for these two is going to be challenging. The smaller, but not lesser, negative doublet weighs "only" 414 grams, and is unmounted, edges painted black with elements glued together. I took a chance on these, as the big lens for half off, and at a total price well below 200€ shipping, taxes and customs included wasn't too bad if these can be combined to even a reasonably good fl=465mm f/3 astrograph. Since I'd use mainly narrow band filters with it, I'm not too concerned about color aberrations, mainly about the image plane flatness for the fair size CCD sensor in SXVR-H18. The next step is to create a temporary rig for determining correct spacing between elements in order to reach the desired focal lenght, the thin lens equations say it's in the order of 150-160 mm, but this is now the real world. In theory short test exposures should be doable with it as well before creating the actual tube assembly. 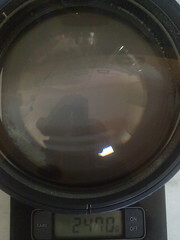 The structure for the OTA served a challenge, as the back focal distance from the negative element to image plane at infinity focus is fairly short, in the order of 80 millimeters at desired focal length. This leaves out the option of building a rigid tube and attaching a commercial focuser at the back, but I realized I might just be able to construct a Huge Crayford focuser and put the optics into the inner tube and attach the camera to the outer tube, eating only 15-20 millimeters of the focus travel. As a result the final tube would end up around 20cm diameter and 20cm long looking more like a snare drum than a telescope, but who cares.